Today we found a total of 33 cents- a quarter, a nickel, and three pennies. A strange thing happened when I was out and about today. As I passed a neighborhood in the village today, someone was blasting the song "Lover Man" by Billie Holiday from their first floor walk up apartment. It was fitting as the sky looked so gloomy and the air thick with cool remembrance. Nostalgia. This is how autumn days are supposed to be. Today we found five pennies scattered around the mall. Happy Fall everyone!! Hopefully the colder days will incite more change dropping :) Right now it looks as though we won't be hitting the 330 mark for the changepot's October birthday but the fact that we've surpassed the 1K mark is an astounding feat in itself. 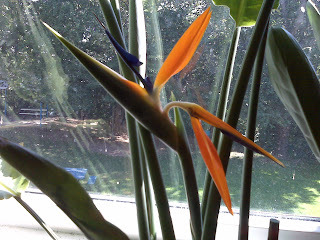 Check out this flower that bloomed in one of my household plants. Isn't it wild? Today we found three pennies while walking around the mall. I think my youngest may have found a nickel while I was on the phone but since she's sleeping over her best friend's house I don't have access to her changepot purse. Today we found a total of 53 cents- a quarter, a dime, a nickel, and thirteen pennies- all found by hubby at work. I passed a dime that looked retrievable so i'll try to go back for it this weekend. Today we found $0.06- a nickel and a penny. The nickel was found in a shopping mall parking lot and the penny was found in front of Stop N Shop. We found a total of $0.27- and a canadian penny- during our mini vacation. One of the pennies is a 1942 wheat so we didn't add it to the totals. The penny along with the canadian coin do not count toward our current total because they have been set aside for resale at a future coin show. We had so much fun despite the rain!! I will post pictures from our finds later on today when I download the files onto this computer. Shown below: Here is a rare find- a wheat penny outside a RED SOX loving pizzeria in Cape Cod! Good pizza despite their taste for baseball teams hehehe. Shown Below: Here is a picture of the first two pennies found in Masachusetts- the vehicle behind us got a good chuckle out of us bolting out at the stop light to grab the wayward coins! Today we found six cents- a nickel and a penny. While I am documenting it on here, the day isn't over yet. If I find more change I'll add it here in the form of an update. We are heading out of town for a few days (our first vacation for 2008 lol) so let's see what a change of venue will bring to the Changepot. In commemoration of the events of 9/11, here is a moving tribute by Woody Ulmer and Kurt Bestor entitled: Prayer for the children. I remember all too clearly what happened that day. It seems like so many people live in denial that 9/11 ever happened. Today we found a total of 28 cents- two dimes and eight pennies- at CVS, Dunkin' Donuts, and Stop N Shop. I engaged in an interesting conversation with a police officer about found money. Apparently there is a blue law that states if you find money inside a store, it's considered store property as much as the items the store sells (even if it's a penny). What I don't understand is why employees won't pick up the change when they 'clean' the store. When I told him about my blog and how we document our change finds, he smiled. The Changepot is turning three in less than a month!!! We're all very excited here! Today we found a total of twenty three cents- two dimes and three pennies. I was reading an article today about a woman using dollar bill rolls to wrap gifts. I got such a kick out of it, I decided to post the link here. Today we found a total of 14 cents- a dime and four pennies. The dime came from my oldest and the four pennies were scattered around the neighborhood here. One penny is so badly scratched that it appears silvery and outstretched. I think this one will have to be traded in at the local bank eventually. Today we found a total of 49 cents- three dimes, one nickel, and fourteen pennies. The majority of the find came from hubby's business trip. Apparently people dislike random change at 7-11. The Changepot won't turn away any funds whatsoever! P.S. While I usually like discussing politics and respect what other party affiliates have to say, I deleted a comment left on this blog today that offered an opinion about my political preference. We all have our beliefs and faiths in our candidates. America is great enough to allow freedom of speech but I won't entertain bullish comments about political affiliation on this blog. There are forums specifically for that cause. This blog is about finding change and that's how it will stay. Found a total of 21 cents- two dimes and a lonely penny. The first dime and penny were found on the way to Dunkin Donuts and the other dime was found under the steps of the former Coast Guard exchange. Two dimes in one day... I'm feeling lucky!! Today we found a total of seven cents- a nickel and two pennies. Not much else to report since the kiddies are back in school, my change hunters are pretty busy now! No money found today BUT I think we found a gold nugget in VP nominee Sarah Palin. She's getting my vote!! Today hubby found a lucky penny- while doing his rounds. I didn't get out most of the day as I was cleaning the house. Today I found a penny by Dunkin Donuts while I picked up my morning brew. We'll be venturing out later today but I wanted to document the find before I step out.